Thermal mineral springs of Niška Banja are important hydrographic objects of national significance for Republic of Serbia primarily because of their physical and chemical properties. The true balneophysical value of Niška Banja had been unknown up to 1909 when doctor Marko Leco first discovered the physical-chemical composition and radioactivity of the water. Niška Banja has three basic thermal mineral springs: Main Spring (King’s Spring), Suva Banja and Školska Česma. Main Spring (King’s Spring) gives 35-40 l/s. 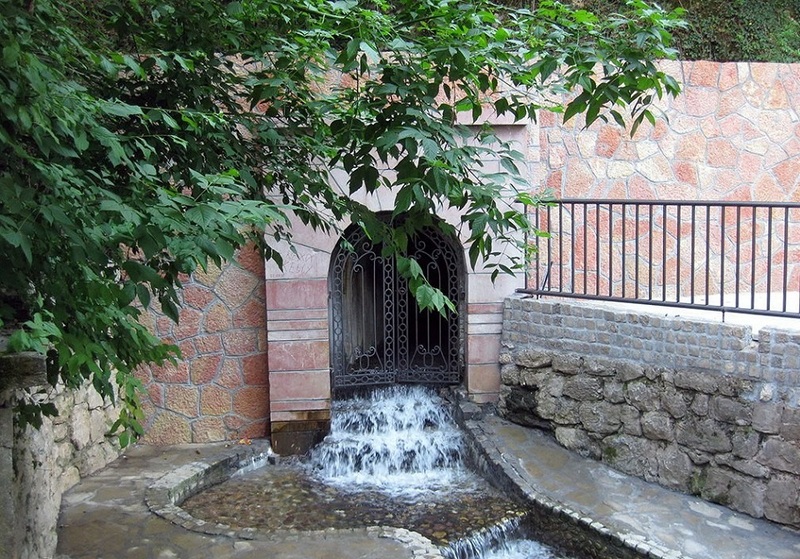 It is one of the most prolific springs in Serbia with the water temperature constantly between 38.2 °C and 38.9 °C. It is classified as a radioactive homeotherm. Suva Banja is the second most important spring in Niška Banja. Its water output is 14-42 l/s. The water temperature varies from 12 °C to 37 °C. It is classified as a radioactive homeotherm. It is characterized by substantial fluctuation in water temperature, output and radioactivity. Školska Česma’s temperature ranges from 17°C to 19°C and its output is around 2.5l/s. The water is suitable for drinking and it is regarded as a remedy for many health disorders. It also belongs to the class of radioactive homeotherms with the considerable content of calcium, magnesium, hydrocarbons, aluminum oxide, iron oxide and silicone oxide. Institue Niška Banja uses the water from Main Spring (King’s Spring) which belongs to Staro Kupatilo building. The water from this spring is properly stored in Staro Kupatilo. The stored water is distributed to other Institute’s buildings through a pipe system (Staro Kupatilo pool – 28,8м3, Terme pool – 36 м3, Zelengora pool – 33м3, Radon – 500м3 and a number of bathtubs in all buildings). The result of the physical-chemical composition analysis of the thermal mineral water from Main Spring (King’s Spring). The analysis was done by the Institute for Rehabilitation Belgrade, Balneoclimatology department. The thermal mineral water of Niška Banja is classified as a mildly alkaline oligomineral calcium magnesium hydrocarbon radioactive (radon) homeotherm. The natural thermal mineral water is slightly mineralized (dry matter at 180°C is 0.271 g/l). The dominant cations are calcium (Ca) and magnesium (Mg) while dominant anions are hydrocarbons (HCO3). The presence of dissolved carbon oxide (CO2) and hydrogen sulphide (H2S) is very discreet. The temperature of 38°C puts the water in the class of homeotherm waters which makes it suitable for bathing, spraying, flushing, and inhalation without any additional heating. The water is applied as a mineral bath, an underwater massage, hydro-kinesiotherapy in a pool, and inhalation for respiratory diseases. The radioactive (radon) oligo mineral homeotherm represents a typical low-mineralized radon-infused water where radon itself is the main balneophysical factor which in balneological sense identifies Niška Banja in the full range of its indications.